A family melodrama unfolds on the RMS Titanic. 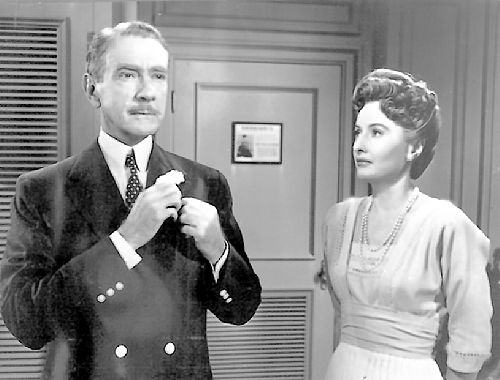 Wealthy British couple Julia and Richard Sturges (Barbara Stanwyck and Clifton Webb) are in an unhappy marriage. Having had enough Julia takes her two children aboard Titanic in the hopes of them starting a new life in America. 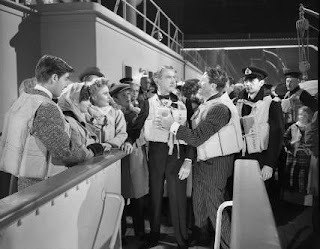 Richard manages a ticket for the voyage and attempts to convince her to let him take custody of the children, allowing them to be raised in the upper class manor he feels fit. 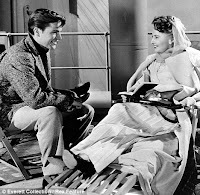 Also aboard is 20-year-old college student Gifford Rogers (Robert Wagner), who takes a liking to the Sturges daughter Annette (Audrey Dalton). All this drama soon seems very petty and inconsequential when Titanic hits an iceberg and begins to sink. Now everyone has much graver problems to deal with. I ended up watching Titanic in two sittings. Normally I don’t like doing that, but it was late and the first part of the movie wasn’t really gripping me. On night two I picked things up again and the second half of the movie did very little to redeem it for me. For those hoping for an early historical telling of the Titanic disaster they’re in for disappointment. This is more a soap opera drama rather than any kind of historical tale. The large of bulk of the story concerns the family trials of the Sturges clan and the budding romance of “Giff” and Annette. And I can’t say any of it was very engaging. This is a very 1950’s Hollywood melodrama. The movie is two/thirds of this bickering between Stuges and Stanwyck and a hum-drum shipboard romance between Wagner and Dalton. It was a long toe-tapper for me awaiting that iceberg. For a movie set on the biggest ocean liner at the time, scenes often feel very claustrophobic. I’m not sure what it is. So many scenes take place in closed off rooms on the ship often it looked like they were just in a hotel. There are few expansive shots of the ships hallways that convey the scale of the ship, but I was surprised how the vast majority of scenes take place in these confined spaces. The actors are all fine for what the material is, but there’s nothing particularly memorable about any of it. Also some of the portrayals of the characters don’t feel like they are existing in 1912. The way Webb plays the wealthy noble Sturges stood out to me in particular. He was much less like a proper gentleman from the early part of the century than just a rich snooty guy in 1953. At least that’s the way he came across to me. I have to mention Stanwyck, who I’m a fan of. She was still very glamorous and good looking in this. At this point she was a middle-aged actress, but she was was still looking very attractive. I thought she was more attractive than Dalton as her daughter. If I was Wagner I would have hit on Stanwyck! Since watching this movie I read a bit about it and read that Wagner and Stanwyck began an affair after meeting on the set of Titanic. Apparently me and Wagner the actor were thinking on the same page. There’s a few drops of the historical characters from the real Titanic tale. Thelma Ritter plays a variation of Molly Brown. I think there was some problems with the Brown estate at the time so they couldn’t say she was Brown, but it’s clear that’s who she’s meant to be. Somehow seeing Ritter in this period role was off-putting to me. I so associate her with her other contemporary working-class performances it was jarring to see her in big frilly dresses. There are also glimpses of the Captain, the Astors, some of the officers, as more of the elements of the real Titanic story are shown. but they’re all fleeting. The historical accuracy is pretty limp. 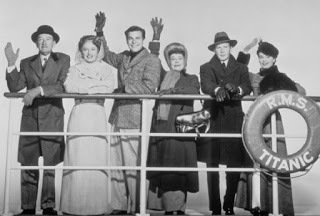 The focus is on the Sturges clan and the dramatics they endure before the sinking and as I’ve said, I found it very dry and boring. When Stanwyck randomly meets a defrocked priest I was praying for the collision. When the iceberg arrives on the scene things begin to happen very fast – and I mean very fast! Lifeboats get lowered immediately. Passengers are scrambling all over the place. Richard mans up to ensure his family gets to safety. There’s no subtlety with Richard leading the charge helping as many people as he can, Julia now regretting what has taken place between them., it was somewhat hard for me to take very serious. Yep, it’s very Hollywood melodrama. For those waiting to see how this sinking is handled you’ll be treated to some very dated special effects of a model splashing around in a tank. To be nice about it – it’s not the most convincing dramatization of the disaster. Some of the larger scale shots of the sides of the ship with lifeboats being lowered work much better, but the Titanic as a whole looks like it’s a bathtub toy. Probably the most notorious moment from this ’53 version of the story is as the passengers await their final fate they all stop and break into song singing Nearer My God To Thee just before Titanic makes its final plunge. It is awfully silly, but I can’t harp on that part very much. As outlandish and theatrical as that scene plays today, it does fit with a 1953 Hollywood melodrama of this type and probably didn’t seem very unusual back then. It probably packed a real wallop for audiences in ’53 and got people crying. Had this story taken place on another ship and the movie had a different title I’m not sure this movie would be remembered. I suppose this might of been good for its time, but thinking how A Night To Remember came out five years later it’s hard to give this a pass. This Titanic story was not for me. I saw this movie once, and I never wanted to see it again! You made a good call on this one. I was never invested in the characters. The ship sinking seems to have been a bit of an afterthought. I seem to remember there was a lapsed priest whose only function was to come in and out of the story to give plot points. Much like an iceberg, Avoid at All Costs. It'll sink two hours of your life. I recall seeing A Night To Remember and coming away from that film thinking it was almost better than Titanic (1997). So many shots and ideas from that film came up in the Cameron version that I was not sure if Cameron was paying homage or plain stealing because he could do no better ? The only thing I think I remember from this version reviewed was the ship blowing up as it disappeared into the sea. 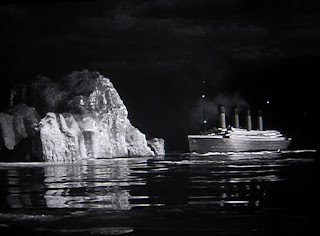 Cameron has always claimed that the movie A Night to Remember was the inspiration behind Titanic. If he claimed otherwise, I would be more condemning. Excellent analysis hap…and it has ultimately made me decide that i never want to see this film. I like Stanwyck and I can take 1950s melodrama, but not this kind of Hollywood nonsense which is no doubt similar to THE DIARY OF ANNE FRANK in how it treats the real life tale and depicts its now-recognizable characters. Even Thelma Ritter as Molly Brown fails to real me in you could say and I adore her from films like REAR WINDOW and A LETTER TO THREE WIVES. The Cameron version has issues, but it still seems eminently more watchable than this version, along with A NIGHT TO REMEMBER of course.